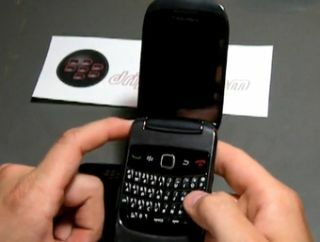 Those of you wondering where RIM is going to take its BlackBerry range need look no further than the new BlackBerry Clamshell 9670. The new phone has been given a pretty comprehensive walkthrough from BlackBerry fansite Driphter.com, and despite the slightly chunky stylings gets a fairly good review. The new phone has a large flip-up screen, and another big display on the front, raising the possibility of a touchscreen exterior for easy mail and media navigation. It's also featuring a 5MP camera, has 512MB of internal memory (with a microSD card slot too) and is running BlackBerry OS 6.0. The new UI also gets a thumbs-up, with colour categorisation for messages for different people and Twitter and YouTube applications included as standard. We're waiting to hear more about this and the BlackBerry Bold slider coming in the near future, so stay tuned to see whether RIM is successful at branching out into new chassis types.